We've been fans of eco-friendly Artterro Arts & Crafts Kits for a while, but now there's a new kit in town that your child will go bug wild for. 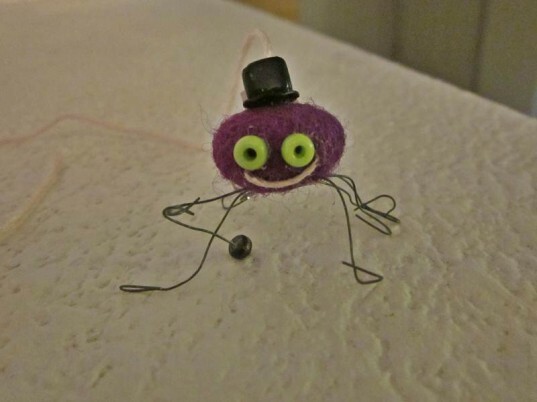 The new Artterro Wool Felt Bug Kit is a creative and fun all-in-one art kit that allows your child to make oodles of creepy cute bugs and even offers a unique art frame to display the finished bugs in. Keep reading to learn more about this new imaginative art kit from Artterro. 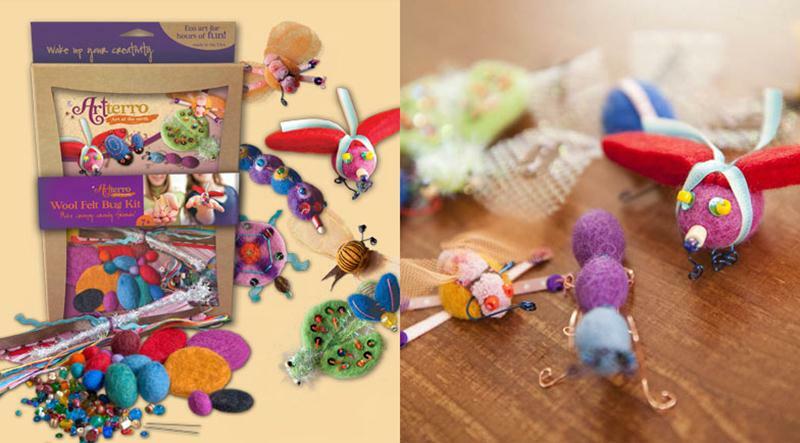 The Artterro Wool Felt Bug Kit comes with enough eco-friendly craft supplies to create 7 adorable bugs, including beautiful and colorful natural 100% wool felt shapes, an array of glass beads and wooden beads, pretty sequins, lovely ribbon choices, a rainbow of crafting thread and needles. Each Artterro kit is one-of-a-kind, so craft supplies will vary, but you’re guaranteed to get a wonderful assortment, no matter what. 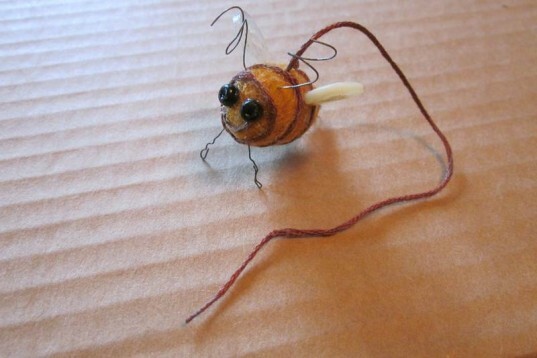 All your child will need to get started making bugs are scissors and glue. Since we last checked in with Artterro, they’ve changed their packaging for the better. 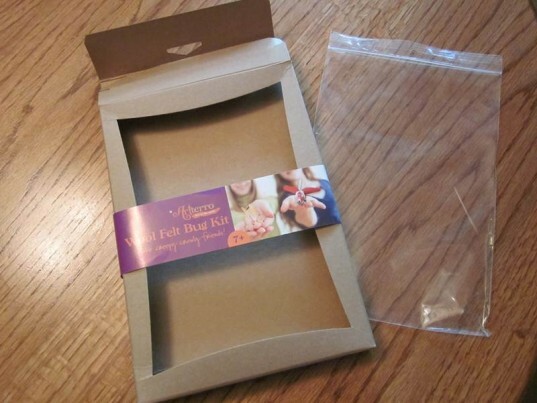 The company always used reusable packaging, but now their packaging is actually part of the project. 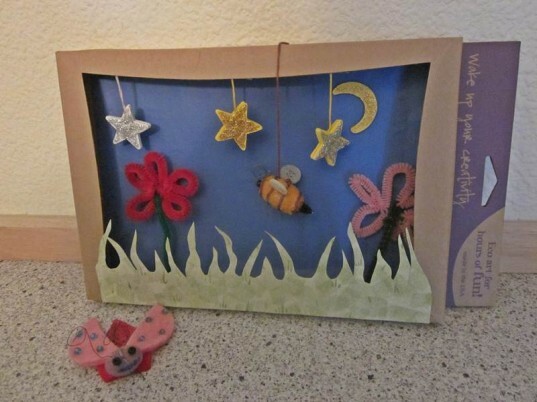 Each box seamlessly transforms into a lovely showcase frame, in which your child can show off his art work. Your little one can decorate the box as he sees fit and hang it up. Each set also comes with a reusable, easy to reseal bag that extra art supplies may be stored in. As with all other Artterro art kits, this buggy art kit comes with a super idea sheet that gives children idea prompts, but doesn’t force ready-made projects. Your child can read the guide for tips, but he’ll still be encouraged to engage in open-active design and create his own project ideas. This is awesome because two different kids will come up with their own very unique bug ideas, not cookie cutter projects. My 13-year-old and 10-year-old handled this art kit mostly on their own, with little trouble. Often, art projects take some parent help or encouragement, but with this art kit, the kids were so excited with the uniqueness of the set that they dug right in alone. Also, although there was needle work involved, other than tying a few knots and helping to figure out the more tricky antennas, my two kids were still able to go it alone. Good news for parents who need a little downtime. Hand over this kit and you get a nice break as your kids have fun creating. Note, this kit is not recommended for kids under 7 years, and due to smaller parts and the needle work, I agree. The new packaging was a huge hit with my kids. They loved the idea of reusing the whole box as a display and decided to make their own bug world with it. They added some craft paper, wooden stars, pipe cleaners and glitter (from our art supply closet) and made a cute nighttime bug world. Although they’re still adding to it, as you can see from the picture above, it’s pretty cool already. All of Artterro’s art kits are kid-safe, fun and eco-friendly. 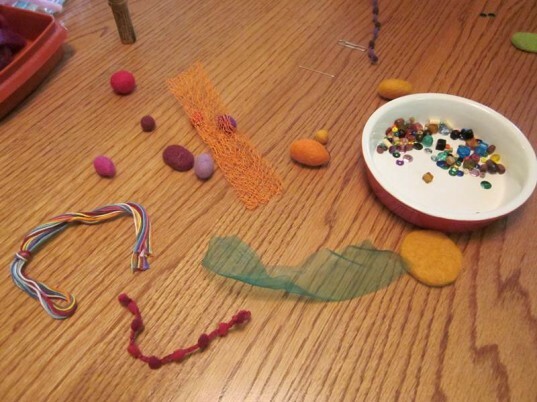 Artterro offers kits containing beautiful, unique high-quality natural materials, such as 100% wool felt, 100% post-consumer waste decorative handmade paper, glass and wooden beads, cotton thread, hand batiked cotton fabric and copper wire. Plus, all of Artterro’s packaging inserts and marketing materials are printed on recycled paper (most of it 100% PCW) using vegetable based inks and renewable energy. My kids loved this bug kit, and noted that they’d recommend it to any of their friends or other kids. However, just in case your child isn’t into bugs, Artterro offers a large selection of other equally wonderful creative kits to choose from, such as a bubble wand kit, art dolls kit, garden art kit, an amazingly awesome paint with wool kit and many more. If you haven’t tried Artterro yet, now is a great time to order one or two for your favorite little artist. Most Artterro kits are $20 or less, which is a great price for an eco-friendly gift and means you can afford to try more than one. 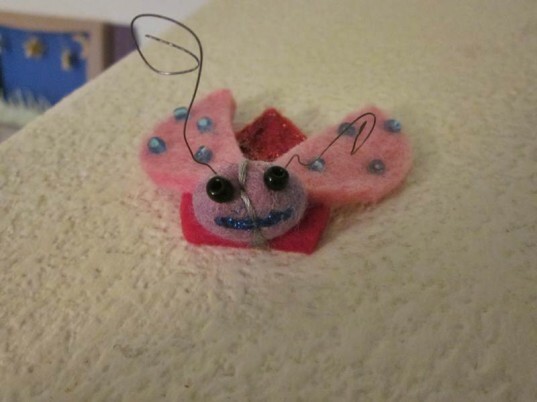 The Artterro Wool Felt Bug Kit comes with enough eco-friendly craft supplies to create 7 adorable bugs, including beautiful and colorful natural 100% wool felt shapes, an array of glass beads and wooden beads, pretty sequins, lovely ribbon choices, a rainbow of crafting thread and needles. Each Artterro kit is one-of-a-kind, so craft supplies will vary, but you're guaranteed to get a wonderful assortment, no matter what. All your child will need to get started making bugs are scissors and glue. Since we last checked in with Artterro, they've changed their packaging for the better. The company always used reusable packaging, but now their packaging is actually part of the project. Each box seamlessly transforms into a lovely showcase frame, in which your child can show off his art work. Your little one can decorate the box as he sees fit and hang it up. Each set also comes with a reusable, easy to reseal bag that extra art supplies may be stored in. As with all other Artterro art kits, this buggy art kit comes with a super idea sheet that gives children idea prompts, but doesn't force ready-made projects. Your child can read the guide for tips, but he'll still be encouraged to engage in open-active design and create his own project ideas. This is awesome because two different kids will come up with their own very unique bug ideas, not cookie cutter projects. The new packaging was a huge hit with my kids. They loved the idea of reusing the whole box as a display and decided to make their own bug world with it. They added some craft paper, wooden stars, pipe cleaners and glitter (from our art supply closet) and made a cute nighttime bug world. Although they're still adding to it, as you can see from the picture above, it's pretty cool already. All of Artterro's art kits are kid-safe, fun and eco-friendly. Artterro offers kits containing beautiful, unique high-quality natural materials, such as 100% wool felt, 100% post-consumer waste decorative handmade paper, glass and wooden beads, cotton thread, hand batiked cotton fabric and copper wire. Plus, all of Artterro’s packaging inserts and marketing materials are printed on recycled paper (most of it 100% PCW) using vegetable based inks and renewable energy. 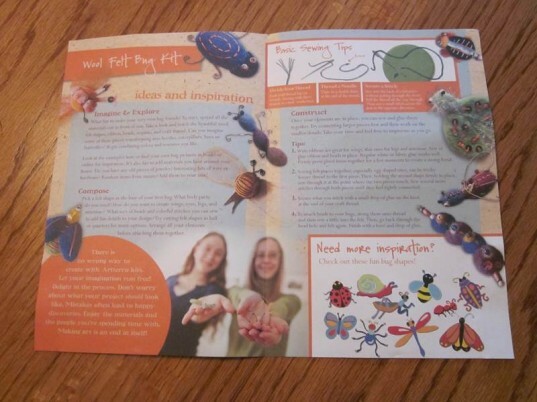 My kids loved this bug kit, and noted that they'd recommend it to any of their friends or other kids. However, just in case your child isn't into bugs, Artterro offers a large selection of other equally wonderful creative kits to choose from, such as a bubble wand kit, art dolls kit, garden art kit, an amazingly awesome paint with wool kit and many more. If you haven't tried Artterro yet, now is a great time to order one or two for your favorite little artist. Most Artterro kits are $20 or less, which is a great price for an eco-friendly gift and means you can afford to try more than one.